Srinagar: The Kashmir Economic Alliance on Wednesday said that fiddling with Article 35-A will trigger a catastrophe not just in Kashmir but entire South Asia. In a statement, Kashmir Economic Alliance (KEA) chairman Muhammad Yasin Khan said the hearing on sensitive Artcile 35A has heightened tensions in the Kashmir as the people are apprehensive of their fate. Khan said fiddling with Article 35-A could trigger a catastrophe not just in Kashmir but in the entire south Asian region. He said the revocation of Article 35-A will mean that people of all the three regions will lose their share of all resources in the state including jobs and land. “People of this state will end up as being another Palestinians whose land will be taken away by outsiders. We will all lose our identity, collective and individual,” he said, in the statement. “When New Delhi should have been serious to take measures to improve situation through initiation of efforts for final settlement Kashmir in accordance with the aspirations of the people of the state, some hidden forces are hell bent to keep Kashmir on the boil through such sinister petitions, while people are being pushed towards a decisive battle,” Khan who also heads the Kashmir Traders and Federation (KTMF) said. The timing of such cases, he said, looks equally conspiring. “Instead of saying when to have a hearing on such a sensitive case, we appeal the honorable Court to dismiss the petition so that the wild fears in the minds of already victimized people of Jammu and Kashmir come to an end once for all,” Khan said. 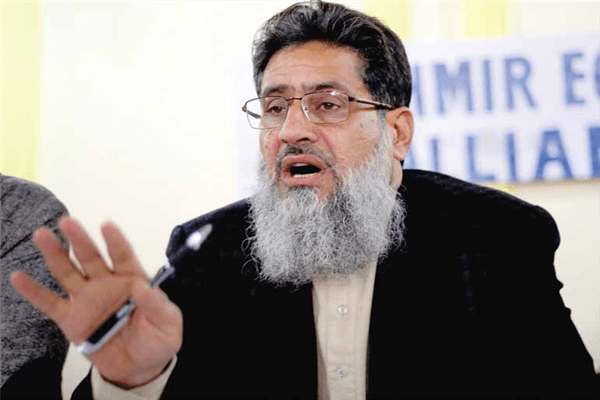 He maintained that the Kashmir Inc was not only speaking on behalf of the business community of the Valley alone but was making public the popular sentiment of the people of state in general. “Like other Kashmiris we have always scarified for the cause of Kashmir and we won’t mind to sacrifice everything if our existence is at stake,” he said. He said it was faulty policies of the government which force the business community to speak on such issues when actually the businessmen should have been provided with a conducive environment to work. The KEA chairman said that New Delhi should show maturity and initiate measures to resolve Kashmir and also reciprocate to Imran Khan’s offer of dialogue on the core issue so that sustainable peace and prosperity in restored. Supporting the stand of the JRL and the Kashmir civil society on the issue, the Kashmir Inc said it was a collective responsibility of every sane individual to be extra cautious.